Our next public meeting is on Sunday, 24 November, at 2.30pm in Corn Exchange & Ormiston Institute, Market Square, Melrose, TD6 9PN (see map) when Professor Geoffrey Palmer will give a talk titled 'The Caribbean Connection'. This year, 2013, marks the 175th anniversary of the total abolition of British slavery in the New World. In the past, many historians have ignored the part that Scots played as owners, managers or other workers on slave plantations in British colonies such as Jamaica. Since 2007, when the 200th anniversary of the abolition of the Slave Trade was celebrated, many people have become interested in the historical aspects and records. 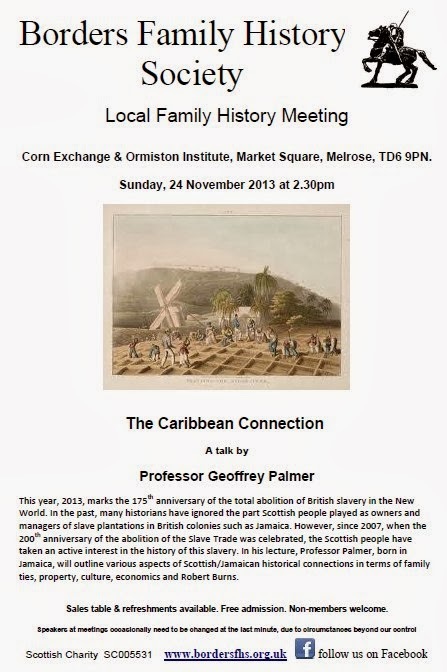 In his talk, Professor Palmer, born in Jamaica, will outline various aspects of Scottish/Jamaican historical connections in terms of family ties, property, culture, economics and Robert Burns. Why not come along to find out more about this fascinating topic ? To mark Remembrance Sunday, Ancestry is providing free access until 12 November to millions of military records including World War I Service Records 1914 – 1920, World War II Army Roll of Honour 1939 – 1945, Naval Medals 1793 – 1972 and Victoria Cross Medals 1857 – 2007. There are also video guides to learn about military records and choose the ones you need. Search for your war heroes, now. 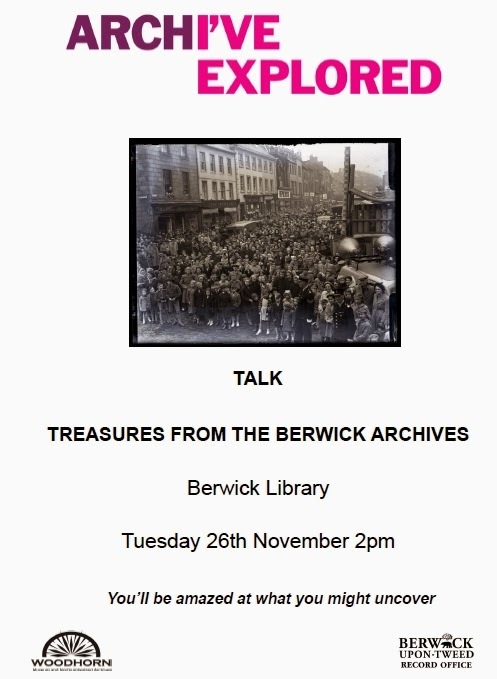 There'll be a talk with images about treasures from the Berwick Archives at Berwick Library, Walkergate, Berwick-upon-Tweed, TD15 1DB on Tuesday, 26 November. Map. Unusually, it's in the afternoon, at 2pm. Halloween (correctly Hallowe'en) is important in Scotland and probably occurs in everyone's family history but it doesn't begin to be celebrated as much as in USA where (in my view), they really go over the top with decorated houses and parties where people have spent fortunes on costumes. there are also Halloween cards. Enjoy this set of Halloween postcards on Flickr from New York Public Library.